The person who puts the recipes in the newspaper every Sunday has my number. He or she is always putting recipes for candy bars and other delectable desserts. And each time, I feel absolutely compelled to make them. Back in December I made Heath Bars. This month is Clark bars. These are so bad but oh so good. Crush graham crackers using a rolling pin (I just smushed mine in the package - it worked fine). Mix together peanut butter, softened butter and vanilla. Mix in graham crackers and powdered sugar, alternating until they are full incorporated and you have a thick, dough-like mixture. 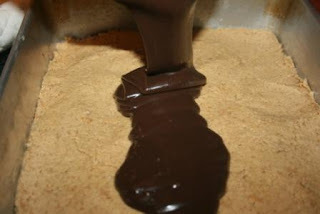 Press peanut butter mixture into the bottom of a 9x13 inch baking dish, making an even layer. Melt chocolate chips and condensed milk together over double broiler or in the microwave until smooth. Spreak over peanut butter mixture. Refridgerate for at least one hour. Cut into small bars before serving. The winner of the bluebird house and squirrel proof bird feeder giveaway is commenter #8 - Taleah from Something Catchy. Congratulations! Thanks to so many of you who entered, apparently bird-related giveaways are popular because that's the most people I've ever had enter one of my giveaways. So thank you! I would need to do walk several times around the block after eating one of these. Those Clark bars look awesome. I'll bookmark this for when I have more PB in the house. Such sinful looking bars! Did you use a dark chocolate on top? YUMMERS. Congratulations to the lucky winner by the way... I reaaallly liked the wire feeder. Ohhhhh...you cannot show such recipes! I'm trying to eat super healthy while I train! Anything-and I mean ANYTHING that combines chocolate and peanut butter has my number! I will try these for sure!! Ahem. Oh, congratulations to your lucky winner!!! I want Clark bars next time I babysit. These look and sound delightful but I'm trying to lose this baby weight. Sigh. Congratulations to the winner! There is going to be a very happy bluebird family at your house pretty soon! Thanks for such a yummy looking recipe Lisa! 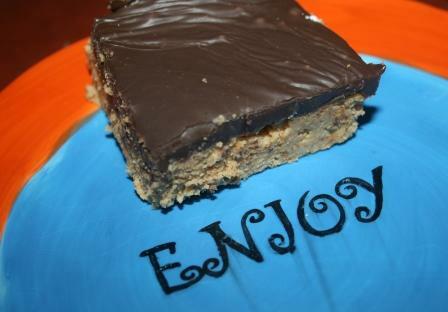 Your homemade clark candy bars looks yummy! Mmmm yum. What a bad influence you are! LOL. These bars look delicious! Congratulations to Taleah! Thank you for the words of encouragement regarding financial support. It is surprising, but my husband really likes getting out from behind a desk. I honestly don't know how you can cook/eat some of the wonderful recipes you share here and still maintain that flat stomach. Incredible! It's a good thing I don't have condensed milk in the house, otherwise I'd be making these right.now.!!! Looks delicious!